If you’re in the market for a durable and reliable inflatable kayak, this Sevylor Tahiti Hunt And Fish Kayak will be the perfect choice for you. It has featured on our best inflatable kayak reviews, It is strong enough to be able to withstand the stronger currents during your hunting and fishing excursions. The dark olive green camouflage color helps you to blend into your environments a bit better, making it ideal for hunting and fishing. You can sneak into your favorite spots without scaring away the wildlife. The Tahiti Hunt And Fish are designed to be able to accommodate one to two paddlers on slow moving rivers, ponds, and smaller lakes. It is surprisingly sturdy and versatile for fishing and hunting expeditions in comparison to standard fishing kayaks. It is also a more affordable hunting and fishing canoe on the market currently. The kayak only weighs roughly 19 lbs., which makes it easy to move around and store. The Tahiti Hunt and Fish is NMMA certified by ABYC Standards. The set comes complete with convenient carry handles and a carry bag to make your journey even more comfortable and easy. Read on to find out more about the Sevylor Tahiti Hunt and Fish canoe. We have included its specifications and features as well as consumer reviews to help you decide whether it is the right one for you. 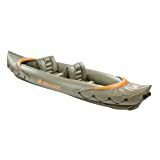 This canoe is great for those looking for a lightweight option to be used on rivers, ponds, and lakes. It is especially great for those areas that are boat can’t get to. The camouflage and quality make it easier to hunt and fish on this boat as you can blend in quietly. The skeg that is sold separately, is a great additional investment as it can help you in windier conditions and moving on rapid waters. Just like any product, the Coleman Sevylor Tahiti Hunt and Fish has its advantages and disadvantages. Below, we have compiled a list of pros and cons to help inform your decision. The Tahiti Hunt and Fish canoe cannot be considered a fancy, feature-filled kayak, but for the price that it’s at, it has everything that you may need on your hunting and fishing excursions. Like other Sevylor kayaks, the Tahiti Hunt and Fish comes complete with Sevylor’s Airtight System that guarantees no leaks. Though it is a lightweight model, it is also sturdy and durable for your excursions on the water. There are three main compartments of the Tahiti Hunt and Fish. All three of those compartments are separate and need to be inflated properly in order to fully and properly inflate the kayak. Two of those compartments are on the side with the last one underneath. This ensures that if one of those compartments deflates or gets ripped, the kayak will remain inflated allowing you to get safely back to shore. The seats are also adjustable, which means that they can be moved accordingly to you and your partner. They can also be moved to face each other rather than in front of one another. Tahiti Hunt and Fish offers just as good maneuverability as any other inflatable kayak. Once you get used to the movements of the kayak, you’ll be able to move it quite nicely and easily across the water. Though, it is highly recommended that you purchase the Sevylor Skeg that is specially made to work well with this model. The skeg will give you enhanced maneuverability to help you find your way to your favorite spots. Other owners of the Tahiti Hunt and Fish rave about the quality of the construction and the price point that it’s at. They also seem to love the versatility of use that this kayak offers them, due to its construction, balance, and shape. It’s easy for anyone to use, regardless of whether you are a man, woman, or even a child as its basic in terms of functions and is easy to carry without needing help. On the other hand, the point of contention between owners is due to the lack of air pump and paddles with the kayak. However, the price ensures that any contention is unnecessary as it’s quite simple to find the extra accessories online. Many chose to buy this kayak due to the high prices of cruise ship line tours. Some owners even claimed that this was great to travel longer distances, such as the Caribbean Islands, Croatia, and Greece to name a few. To keep it in the highest condition possible, you simply have to ensure that it is cleaned properly and deflated completely. It’s also best if this is stored indoors to minimize any rust or damage from the outside weather elements. Also, it is recommended that you purchase a reliable hand pump beforehand, as this kayak does not come with one included.